As this season of The Bachelor came to a close, fans were shocked by Juan Pablo’s arrogant actions during the final rose episode and the follow-up with host Chris Harrison. Clare told Chris Harrison and viewers that Juan Pablo said something sexually-based and offensive to her during their helicopter ride in St. Lucia. Outraged, Clare addressed the issue with him but then gave him another chance. Afterwards, Juan Pablo discussed future plans with Clare, and the possibility of having children with her. “Help me help you. I’m trying to make you look better…Come up with an articulate thought about this woman next to you who has pledged her devotion to you”. 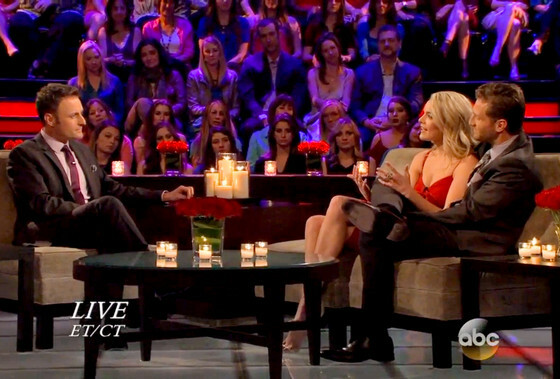 How did the convos w/ #JuanPablo's family not raise HUGE red flags?! When a guys mom tells you he's not a good guy, guess what? HE'S NOT! As fans, producers, contestants, and Bachelor/Bachelorette veterans were all dismayed by Juan Pablo’s behavior throughout the season, we can only guess that winner Nikki will not be able to put up with his refusal to commit or tell her he loves her. Fans and producers can only hope that next season’s bachelorette Andi Dorfman will have a much better outcome than Juan Pablo. This entry was posted in Television Programming and tagged ABC, Andi Dorfman, Chris Harrison, Final Rose Ceremony, Juan Pablo, Reality TV, social tv, The Bachelor, tv by Steph. Bookmark the permalink. I understand where you’re coming from completely about not rushing into marriage, but a lot of fans were upset by how he towards Clare throughout the season. Not only was he disrespectful earlier on, but he also made promises to her the night before the final rose and then chose Nikki, bringing him a lot of negative media and fan attention. Were you surprised when he chose Nikki over Clare, though?